What seems a straightforward, if terrifying, assignment soon descends into Machiavellian treachery and peril as everything in which young Rufinus trusts and believes is called into question and he faces warring commanders, Sarmatian cannibals, vicious dogs, mercenary killers and even a clandestine Imperial agent. In a race against time to save the Emperor, Rufinus will be introduced, willing or not, to the great game. Entertaining, exciting and beautifully researched. 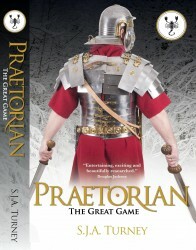 From the Legion to the Guard, from battles to the deep intrigue of court, Praetorian: The Great Game is packed with great characters, wonderfully researched locations and a powerful plot. A tour de force, from the first page to the last, and Mr Turney has thereby presented himself as an author whose books I will proceed to devour, one by one. And as to our black-haired pugilist hero, Rufinus has wormed his way right into my heart – no doubt due to that engaging combination of wit, courage and sheer charm. Ave, Mr Turney, Rome has found a new hero!